The Comprehension Box is a tool for families in grades K-5 to use to support reading success at home. 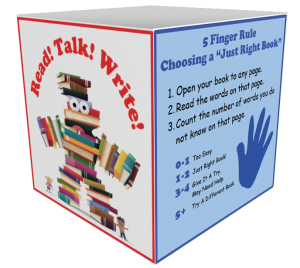 The box supports the 3 key components of reading… being able to read with understanding and then talk and write about what the student read. The sides of the Comprehension Box have strategies that help students improve their ability to read, write, and talk about fiction text. that good readers use to make meaning of the text. which offers ideas on how to write about what you have read in a fun way. used to make sure that books that are too easy or too hard. which can be used to discuss or write about any fiction book. As education changes in this country, there are more and more families who feel that they are unable to support their child in school. Students come home with homework and many families are unable to help. The academic language is vastly different than when most parents were in school. These activities will give families the academic language as well as fun and engaging ways to impact their child’s success in key areas. The Common Core Backpack Activities are a set of engaging, interactive, and motivating activities (Kindergarten -5th grades) designed to increase opportunities for learning at home. The activities are directly aligned with key Common Core Standards that families can use to support mastery in reading comprehension, writing and mathematics. The activities speak to the family who has had very little access to academic language and to the family who is highly engaged. The activities can be used over and over to increase mastery. The activities will expose the families to the academic language and provide a “plain language” breakdown. One or more of the following LEARNING PATTERNS will be incorporated in each activity. Learning strategies embedded in all Common Core Back Pack Activities. For more information on how to bring Common Core Back Pack Activities to your school, please contact us at (510) 922-8606, via email at: info@highexpectationsonline.com, or use our contact form. The Family-School Action Plan is a document used to facilitate a conversation between a parent/caregiver and their child’s teacher. The document helps the teacher and parent identify the student’s challenge area and create a plan for how to improve results. This document should be used when a student is struggling in a particular area (academics, attendance, behavior, etc.). What is unique about the Family-School Action Plan is that it allows the teacher, parent and student to set a goal together and to identify their role in reaching success. Families: Please watch this short presentation on how to complete a Family-School Action Plan with your child’s teacher.